We, as Christians, have spent much energy finding flaws in public education, public policy, cultural decay, and religious degeneration. Enough of this. These flaws are in the public sector. It is time now to rebuild a new generation with Biblical principles. We must urge again salvation of souls. Only then may we begin again with a new generation of Christians whose minds and hearts are centered in Christ and taught with Biblical principles. We have retreated too far already, abandoning the very institutions that a new generation of Christians will need for proper education and service. Consider fresh again that our problems lie, not in the public arena, but closer to home, within our own "Christian" culture and our very hearts and homes. These must be reclaimed, bringing into captivity every thought to the obedience of Christ. This is Biblical education. When this is begun, then we can begin to reclaim young lives. This duty of training the next generation is a responsibility that God has entrusted to all of us as Christians. With this task in view, this book studies individual Bible words that reveal God's keys to success in this area. It is the author's prayer that this study will assist Christians in fulfilling their God-given responsibility, and that Biblical Christianity will be committed "to faithful men, who shall be able to teach others also." (II Timothy 2:2) Mary Huffman has devoted her life to Biblical education. She has a Master's Degree in Ministry from South India Baptist Bible College in India. She is intensely interested in Biblical education across all cultures. She has memorized the entire New Testament and large portions of the Old and considers this to be the highest qualification enabling her to serve Christ as her Savior and think like Him as her Lord. 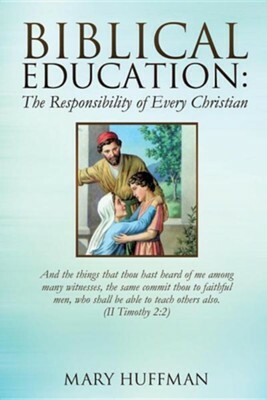 I'm the author/artist and I want to review Biblical Education: The Responsibility of Every Christian.